Daris has been designing custom landscapes in the valley for nearly 10 years. 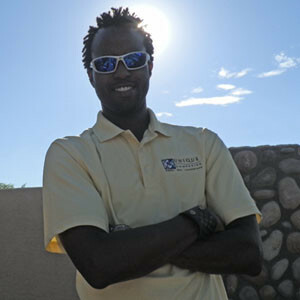 He obtained degrees in Architectural Design and CAD certification through Mesa Community College. In addition, he has earned the title of “Certified Desert Landscaper” by the Phoenix Botanical Gardens, by completing their highly recommended desert landscape program. Daris has a sincere passion and desire to create desert landscapes that are both pleasing to the customers as well as sustainable for our desert environment. He completed an intern program through a well know landscape company in the Ahwatukee area and has also designed pools for one of the major pool builders in the Phoenix area. Daris is originally from Ann Arbor Michigan where he attended the University of Michigan. His studies included Engineering and Spanish. He moved to Arizona in 2000 and fell in love with the desert terrain. His love of the outdoors and desert plant life led him to pursue his interest in designing outdoor living environments. Daris is married with 3 children, 7 year old twin boys and a 5 year old daughter. The pure joy of seeing his family enjoy the beautiful outdoor desert environment is one of the many reasons why he has such a passion for creating outdoor living spaces.